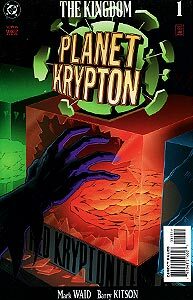 Brief Synopsis: A girl hiding from her past finds comfort at Planet Krypton. Issue Notes: Tie-in to the 5th-week "The Kingdom" event drawing the storyline of Kingdom Come more closely to the familiar DC Universe. 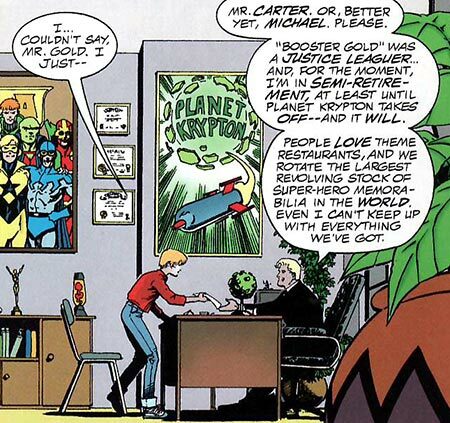 In the Elseworlds mini-series Kingdom Come, Booster Gold is mentioned briefly as the manager of Planet Krypton, a popular super hero themed restaurant. Issue Reprints: This issue has been collected in The Kingdom. Booster Gold is introduced to new employee Rose D'Angelo as Michael Carter, the owner of Metropolis' Planet Krypton, a super hero theme restaurant with "the largest revolving stock of super hero memorabilia in the world." (In fact, as revealed in Superboy #65, Booster has a silent partner in Planet Krypton: Rip Hunter.) Booster is in self-proclaimed semi-retirement as a hero while he concentrates on developing his latest business venture. There is something ironic about Booster Gold, a hero who stole his powers from displays in a super hero themed museum, owning a restaurant containing displays of super hero memorabilia. Rose overhears Booster on the telephone with Batman. Booster is concerned about apparitions in his building. During the conversation, Booster reminds Batman about "that time with Amazo." Booster's battle with Amazo can be seen in JLA #27, (published a few short weeks after this issue). Boosterrific Review: Writer Mark Waid celebrates DC history in this tie-in to the Kingdom mini-series (which is itself a loose post-script to Waid's Kingdom Come mini-series). Fans of DC continuity will no doubt be pleased by the issue, but there is little captivating about the mundane main plot of a waitress who is hiding from her own past.